Bingo players in scary costumes for Boo Bingo. On Thursday, October 29, the Ranch House was visited by a large number of residents dressed in Halloween costumes ready to play bingo. There was a wide variety of attire from Pickleball Man, White Knight, Day of the Dead, Doctor Shots, a team of witches, hula dancers, an angel, a couple of jailbirds, to Betsy Ross and our esteemed GM and bingo caller, Betty Murphy, as Bat Lady. The Food and Beverage Department provided a creative mix of scary buffet items like mummy hotdogs with bloody sauce, witch hair spaghetti with meaty eyeballs and spider web pizza. Pumpkin cookies were the perfect dessert item. 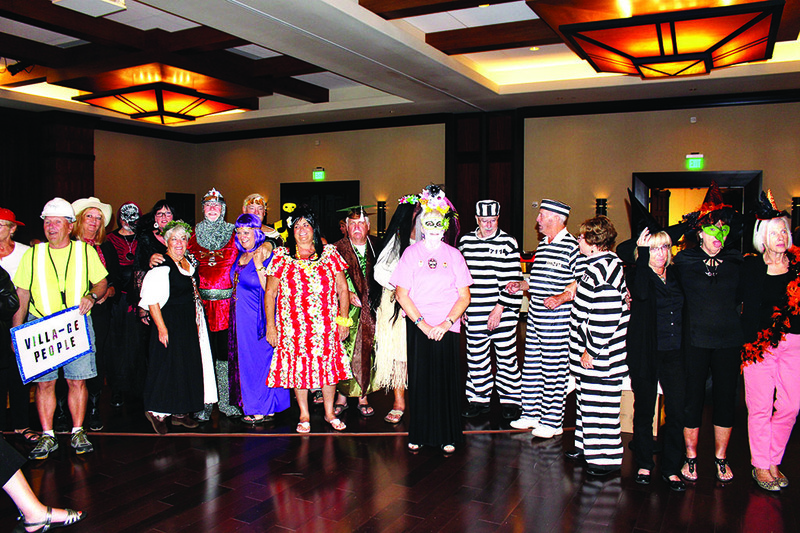 After the buffet dinner attendees used an applaud meter to vote for the best costumes. Eight games of fast paced bingo followed with Betty providing her usual humorous quips and teasing to entertain the crowd. Bingo is one of the most popular and well attended events provided here at the Ranch, and this evening was no exception. Next up is Booby Bingo on November 16, a charity event to support breast cancer research.